The version of Windows that users work with before migrating to Windows 10 will affect the transition process. For Windows 7 or 8 shops, the OS must be activated and have all the latest updates in place before they can move to Windows 10. If everything is up to date and Windows Update is active, the device is ready for the upgrade. A device migrating to Windows 10 requires about 3 GB of space to hold the OS. The architecture and the edition of the previous version of Windows the user had carry over to Windows 10 in the case of an in-place upgrade. For instance, a 64-bit version of Windows 7 transfers to a 64-bit version of Windows 10. Likewise, Windows 7 Pro Edition transfers to Windows 10 Pro Edition. If IT pros want to move users to a different edition or architecture, they must perform a clean installation. The process is a little more complex when migrating to Windows 10 from Windows XP. IT really has no choice but to perform a clean installation because Microsoft does not support an in-place upgrade from Windows XP to Windows 10. IT should test hardware and app compatibility any time it makes an OS migration, but because XP is an older OS, it is particularly important in this scenario. Some apps might need minor updates, while others simply won't work in Windows 10 due to licensing issues or missing installation media. One way to get a grasp on all the apps in the network when migrating to Windows 10 is to use Microsoft's Assessment and Planning Toolkit. The toolkit inventories the apps and informs IT of any apps that might run into compatibility issues. Similarly, Windows 10 is designed to work on newer devices, so many of the devices running Windows XP might not be up to speed. Even if the device meets Windows 10's minimum hardware requirements, that doesn't mean it can run the OS efficiently. 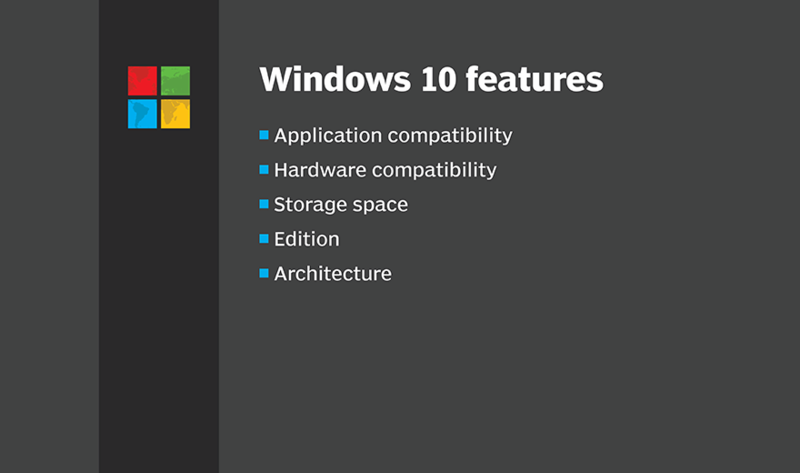 How do you approach the hurdles of moving to Windows 10?